The cemetery takes its name from French Regiments which fought in the vicinity of Souchez 1914-15. 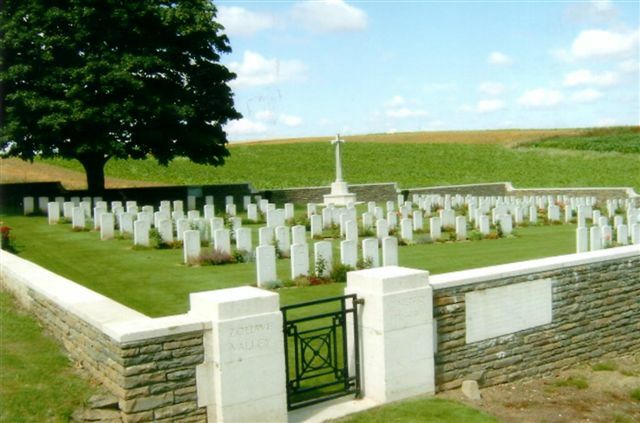 The cemetery was begun in May 1916 and used until June 1917. It suffered severely from shell fire. It was increased after the Armistice by the concentration of graves (which now form Plot I) from a wide area round Souchez. There are now nearly 250, 1914-18 war casualties commemorated in this site. Of these, over a quarter are unidentified and special memorials are erected to 8 soldiers from the United Kingdom and 3 from Canada, known or believed to be buried among them. Five graves in Plot II, identified as a group but not individually, are marked by headstones bearing the additional words: "Buried near this spot". The cemetery covers an area of 1,533 square metres and is enclosed by a rubble wall. One German Soldier is buried in Plot II, Row G. Grave 2.